Our wish is that all interested persons to advise and support them in achieving better shape and general health. Our trained and professional staff, together with you will create exercises and programs that stimulate and motivate to get the desired results. If you like to exercise in a group we will help you with choosing the best way for you. Want to improve your health and meet new people, come and join our group training with professional trainer and improve your lifestyle. Our fitness programs are designed with the modern methods of work, following the latest information from the world of fitness and recreation. Adjusted for beginners, amateurs and athletes, regardless of the gender. Visit our exclusive fitness room equipped with an entirely new and professional equipment for strength and cardio. Be part of the new world of fitness, be part of one of the best fitness centers in Macedonia, we are here for you! Hotel Central offers you the place where you can free your mind, relax body and have one full enjoyment. 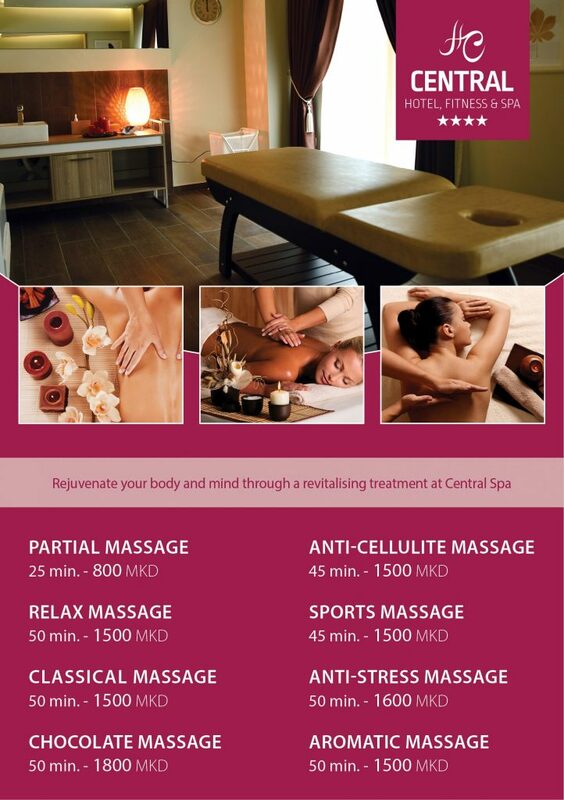 Relax your senses with the services that you offer Central Spa which is part of Hotel Central. Allow yourself a complete revitalization of the spirit by visiting our sauna, steam bath or jacuzzi. – Classical massage 50 min. – 1500 MKD. – Relax massage 50 min. – 1500 MKD. – Partial massage 25 min. – 800 MKD. – Anti-cellulite massage 45 min-1500 MKD. – Chocolate massage 50 min. – 1800 MKD. – Sports massage 45 min. – 1500 MKD. – Antistress massage 50 min. – 1600 MKD. -Aromatic massage 50 min. – 1500 MKD. Welcome, visit our Central Spa and give yourself a unique experience! *Spa access for hotel guests is free of charge, and for other guests one-time access is 500 mkd.